Before Christmas I posted a blog encouraging golfers to set themselves various targets during the year. These ranged from reading a good golf book to enticing someone else to take up the game. I included the suggestion that you should play a special course, one you hadn't tackled before. There are endless choices and now Just Treats Golf have added a helping hand with a special offer at the old classic parkland that is Mullingar Golf Club. 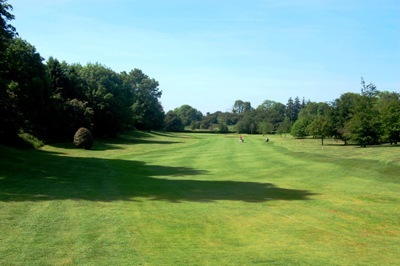 Mullingar's 7th hole shows off the rich woodland around the course [Image from Mullingar's website]. Mullingar got a makeover a few years back with new greens and a slightly modified layout. It has not taken away from the place's charm. Originally designed by the great James Braid (and the legend of the axe and 36 tees), Mullingar has stood the test of time... if anything, it is better than ever. Its 2nd hole remains one of the most feared par threes in the country, requiring 200+ yards of carry from the back tees. It is wooded, tight and calls for straight hitting. It is quite likely that Mullingar will give you a lesson in restrained hitting, but however you play it is an enjoyable education. Two green fees and two all-day breakfast baps with tea/coffee for a total of €44 - a saving of over 50%. Vouchers are valid until 30th April and must be used on Mon, Tues, Thurs and Fri. The offer ends this Friday morning, 8th March. Sign up for Just Treats to get the latest offers sent to your Inbox... like Mullingar or the current offer at Ballyliffin.